Today’s been all about Arsene Wenger as the long-serving Arsenal manager announced he’s finally set to step down at the end of this season. After 22 years, the Frenchman will be making way for someone else to lead the Gunners, with many of the club’s fans barely old enough to remember the team without him. Having drawn 0-0 in the first leg of their Champions League last-16 tie, few expected Arsenal to have it in them to grab something in the away game. And yet, against the reigning European champions at the time, containing the likes of Andrea Pirlo and Kaka at their peak, Arsenal produced a fantastic display, with goals from Cesc Fabregas and Emmanuel Adebayor sending them through. Another win at the San Siro, and this time it was an absolute thrashing as Arsenal ran riot against Inter Milan. The Gunners made a dreadful start in the group stages that season, but this win put them back in contention to go through to the knockout stages and saw them produce some of their finest football. Thierry Henry was in inspired form to score twice, including a stunning solo effort in which he turned Javier Zanetti into mincemeat. 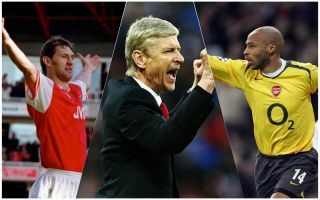 A crucial win at Old Trafford that set Arsenal on their way to claiming the double in Wenger’s first season in charge. Although the Gunners went into this game playing catch-up in the title race, by the end of it they were just six points behind Manchester United with three games in hand. The rest is history. They overtook Sir Alex Ferguson’s side and Wenger won the first of many trophies in his glorious career in England. It may prove to be his last major trophy as Arsenal manager, and many felt at the time like Wenger may have been taking charge of his last game for the club. Arsenal beat Chelsea 2-1 in last season’s FA Cup final to end what had been a disappointing season on a real high as they stunned the champions with a superb display. In many ways, it would have been the ideal way for Wenger to bow out, but he signed a new contract days afterwards.